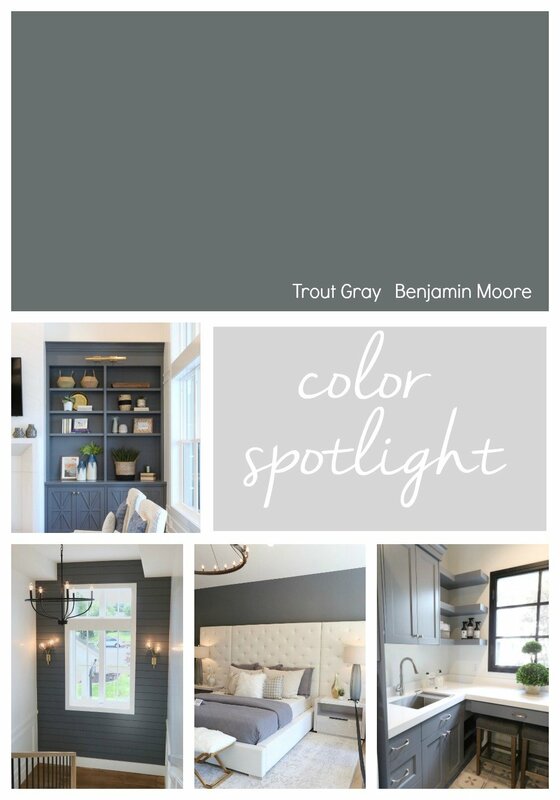 It’s been awhile since I’ve done a Color Spotlight and today I wanted to highlight a gorgeous paint color that has quickly become popular this last year; Benjamin Moore Trout Gray. One of the biggest trends we’ve been seeing in design this last year is the use of dark rich colors on accent walls, cabinetry and on walls. 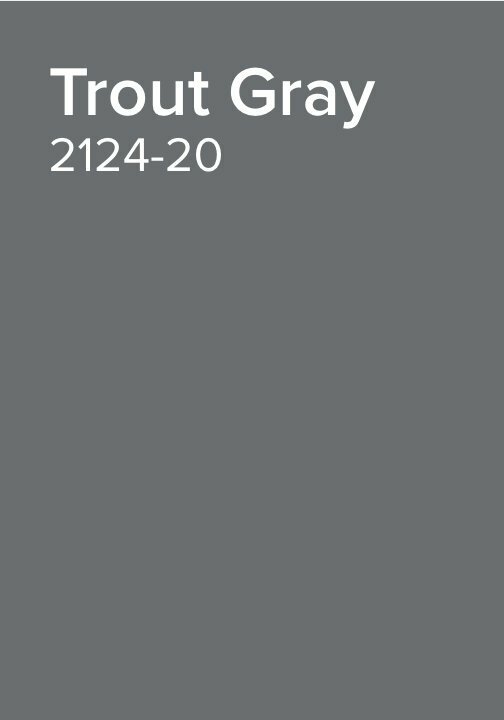 One of the colors I’m seeing used more frequently than others is Benjamin Moore Trout Gray. Trout Gray is an absolutely stunning dark gray with a slight warm undertone. 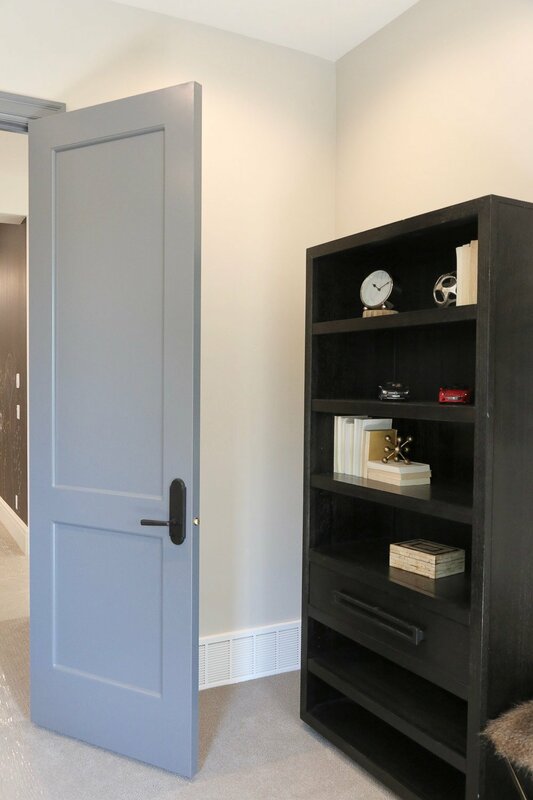 Trout Gray is quickly becoming one of my new favorite colors because it’s so versatile for a dark rich color and it’s perfect for accent walls, cabinetry and interior doors. 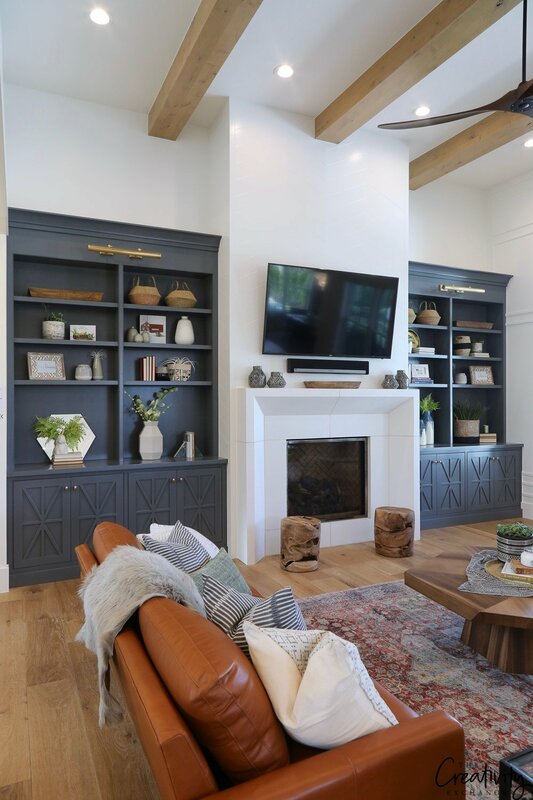 The Millhaven Homes Fox Hollow Farmhouse that I featured last week on the blog here used Trout Gray throughout the home as an accent color and I loved it mixed with crisp white on the walls. I think mixing these beautiful dark rich colors with white is where the magic happens! 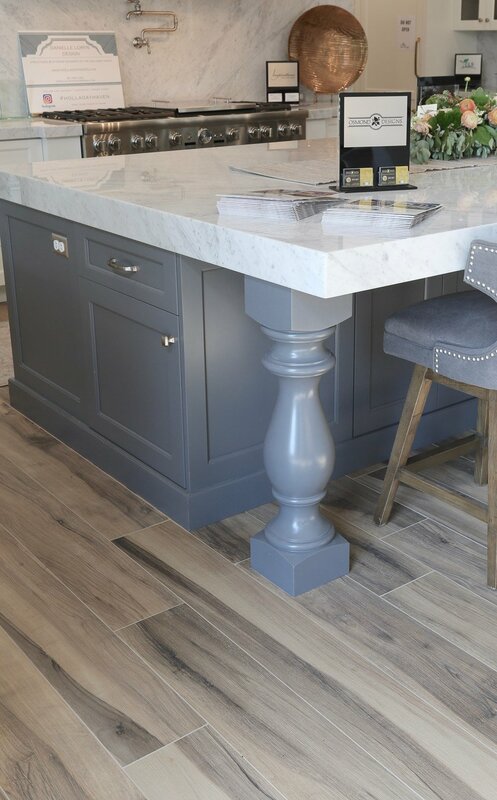 A dark rich color like Trout Gray can really make cabinetry and built-ins the star and focal point in a space. I first noticed Trout Gray last year during the Salt Lake City Parade of Homes in an absolutely gorgeous home built by Tree Haven Homes. In fact, Trout Gray was carried through in almost every area of the home and it was so stunning! 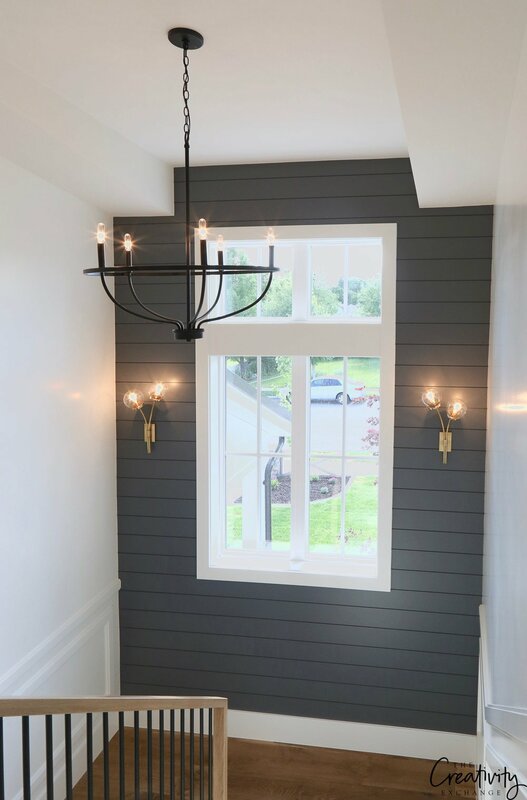 Let me just show you all the ways Trout Gray was carried through the Tree Haven home because this is exactly how I recommend to my own clients how to use and carry through a dark rich color like Trout Gray through a home. In the main family room area, Trout Gray was used over the fireplace. 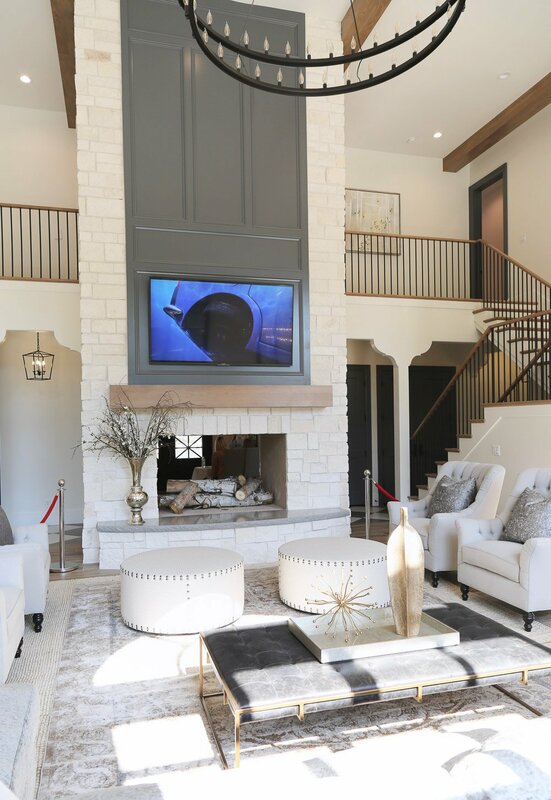 Mixed with the off-white wall color and stone, this was the perfect spot to make a rich color statement and add contrast. In the master bedroom, Trout Gray was used as the wall color. If someone told me they were going to do this, I’m not sure I would have agreed. 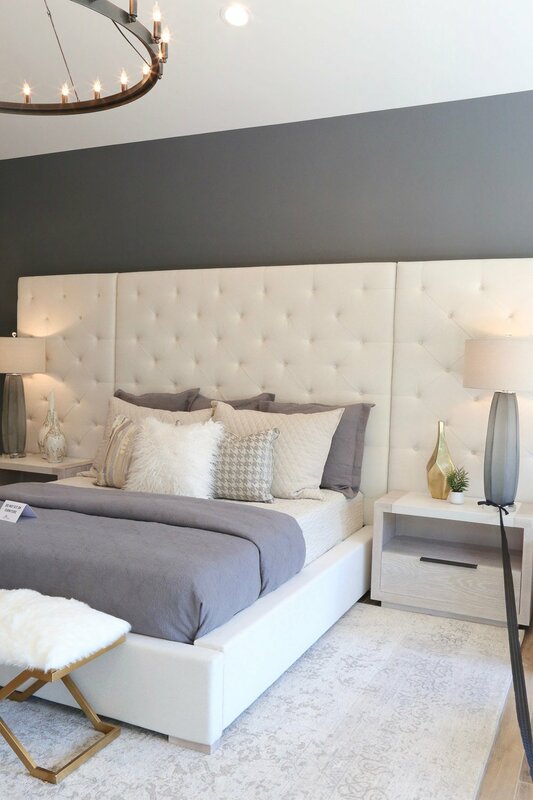 However, mixed with the white tall white ceiling, white bed and light accents, this look is balanced and so beautiful! It’s really amazing! 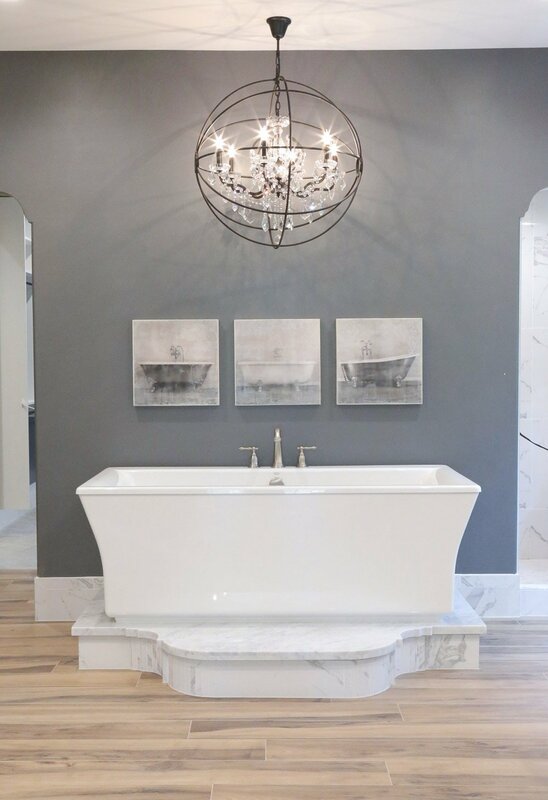 In fact, the designer carried Trout Gray into the master bathroom as well on the wall and it’s beautiful! 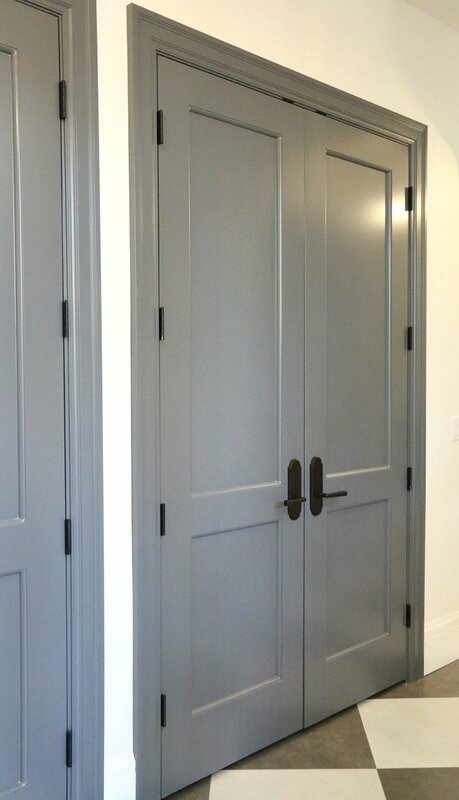 All the interior doors throughout the home was also painted in Trout Gray. Perfect door color to add a little rich drama. 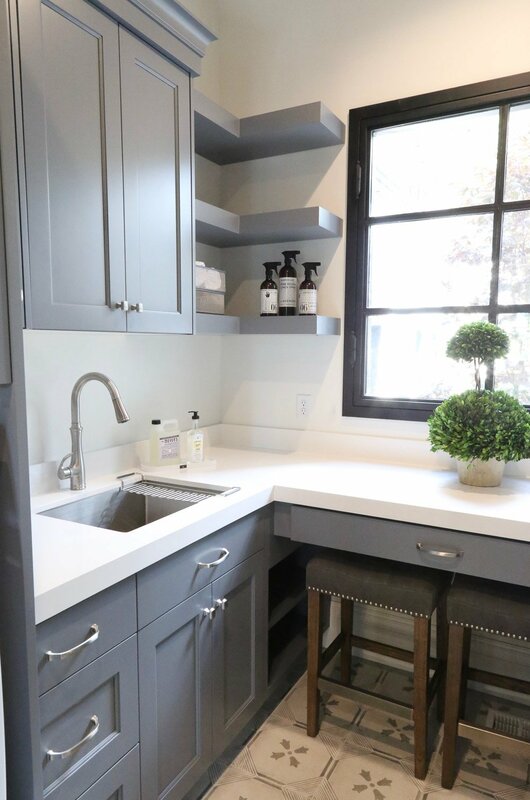 Trout Gray was also used on the cabinetry in the laundry room! Even in the kitchen Trout Gray was used on the island. This is my new favorite island color! 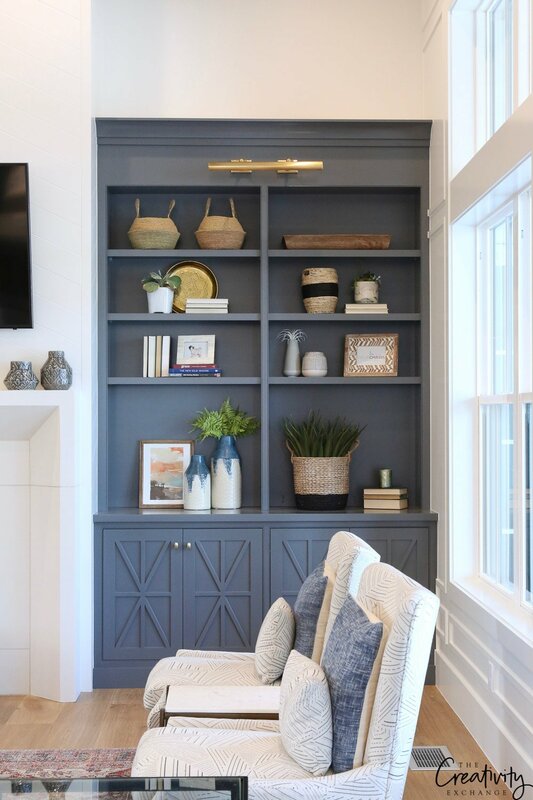 The great thing about carrying an dark rich accent color like Trout Gray through a whole home is that the transition room-to-room is cohesive and you don’t have to worry about matching undertones or choosing complimentary accent colors. 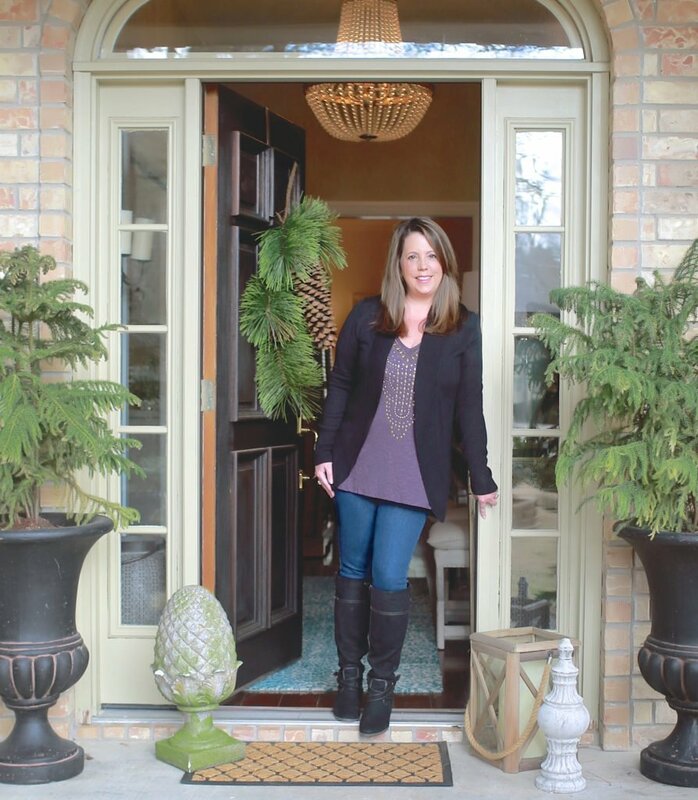 The TreeHaven home is by far the best example I have ever seen of carrying a color through a home beautifully! 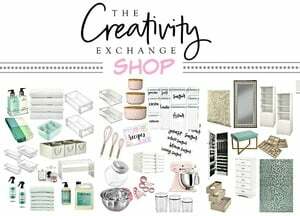 Check out more of my past Color Spotlights for more ideas and inspiration! 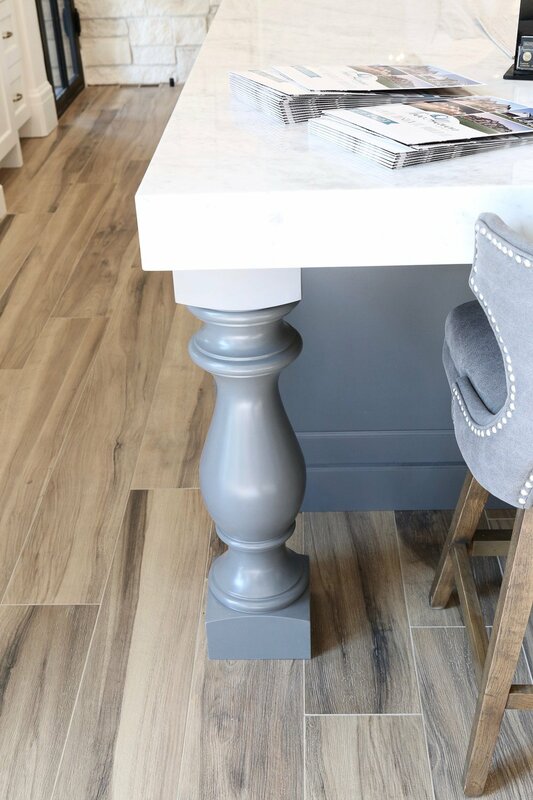 I could definitely see myself using Trout Gray in my home! I could also see myself living in that house!! ? 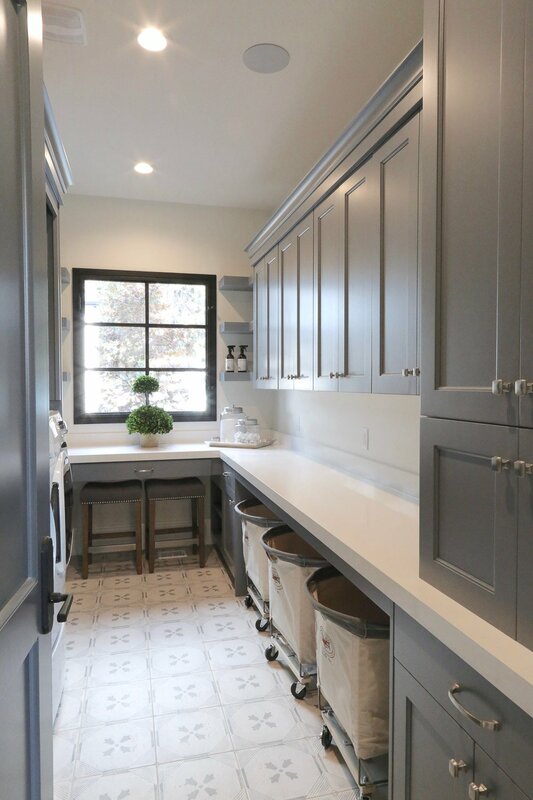 How beautiful is that laundry room! 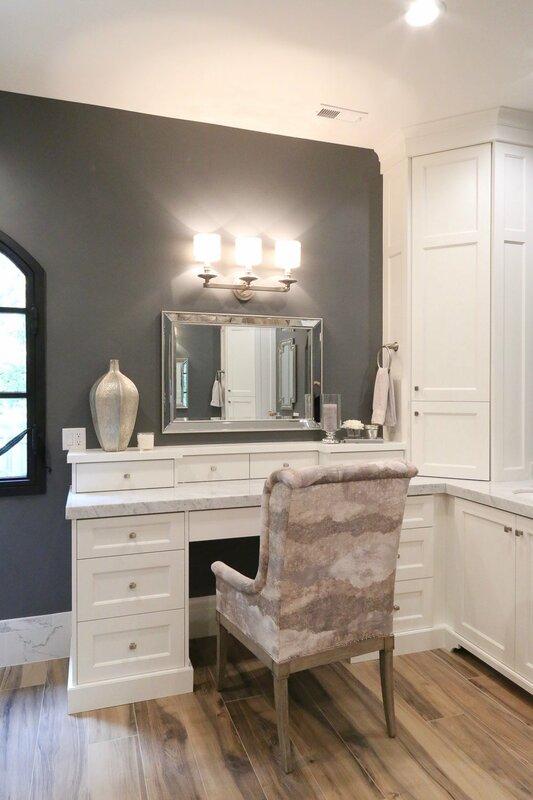 I love how this color has been incorporated throughout the home. Just enough without making it too dark! What white color would you do for the majority of the walls, if this deep grey was used on doors and cabinetry? Also, would you do the baseboard trim in the same white? Hi Cyndi. Thanks for sharing everything. I did an accent wall in my bedroom with trout grey. It’s a smaller room so one wall is good enough I think. I noticed you mentioned silent white would be good for walls and baseboards. I was wondering what your thoughts would be on a room with crown molding. 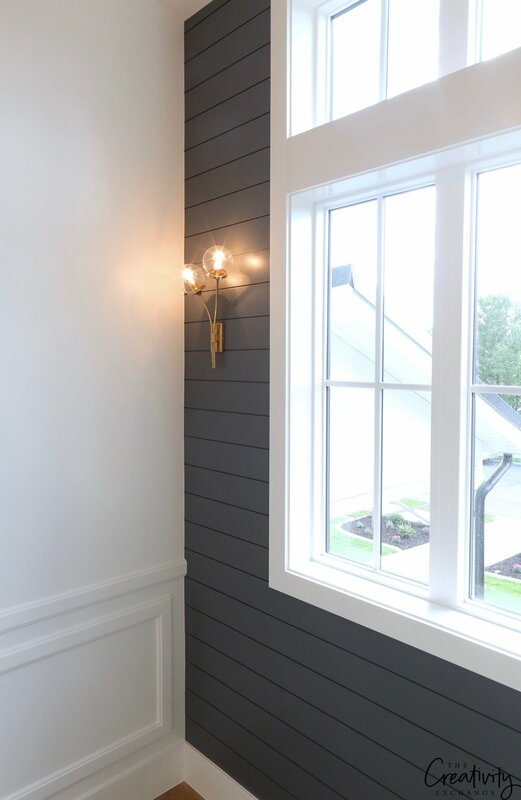 Would you stick with silent white matte finish for both baseboard and crown molding. Also, I assume the ceilings are also silent white? Love the pictures and the insight. Thanks again for sharing! What would be a comparable Benjamin Moore or Sherwin Williams white to the Behr Silent White? hi doing a new house build 2 storey using BM classic grey as main house color ( Balboa mist just in open concept kitchen/living room area for constast where more light?) Chantilly lace is our trim/ceiling/ cabinet color……. for our master bedroom wanting an accent color on ship lap which liking tr oute grey… what color would you recommend for other walls and bathroom ensuite…. chantilly lace or a lighter matching grey to goes with tr oute grey?! Thank you for your time, I enjoy your posts a lot! Can you share the source for canvas laundry baskets?